Charles Cooley attended his first meeting as a newly elected commissioner in 1928. The following night, the existing Mandan City Hall burned to the ground. 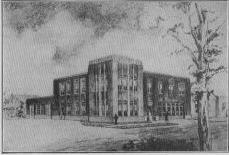 Commissoner Cooley was instrumental in securing a replacement building we know today as the Collins Avenue Civic Building. 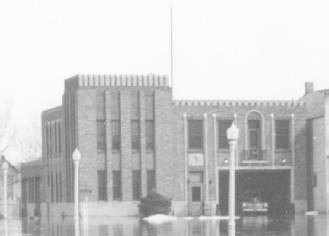 Named a National Outstanding Civic Improvement of 1928, "Mandan's new city hall building is of modern architectural design and well adapted to meet the needs of the municipality. It is being erected for a cost of less than $25,000 and will house the city's officials, the fire equipment and force, the city jail and shop for the repair and storage of street equipment." Art Deco architecture in its simplest form is decorated with materials and was a significant style in North Dakota in the 1920s and 1930s. Rather than add stone ornament to the building, the different colors and patterns of brick were used for visual interest to produce a "modern" appearance and streamlined cost. The Burleigh County Courthouse and the state Capitol in Bismarck are both examples of the style in stone. Many Works Progress Administration (WPA) buildings were also Art Deco style. A cut-granite emblem of Blue Thunder is emblazoned above the street-side entrance. This logo was used in publications of the business community in the 1920�s. Even a soda pop can was distributed with this logo on it. Blue Thunder was a Sioux Scout carrying information, mail or serving as a translator to the military in Mandan. According to his descendent Dakota Goodhouse, he was a tribal historian who kept a winter count (census). Mandan stone sculptor/artist Hynek Rybnicek was commissioned to carve this stone plaque which remains in place today. While originally built as a multi-purpose facility, subsequent modifications and additions have expanded its total square footage but narrowed its purpose. The City's municipal offices and police department were relocated in 1978 and 1986, respectively. The last major renovation in 2003 committed $550,000 to incorporate a fitness center, additional equipment storage and improved staff living facilities. The original vehicle garage was converted into a training room. Vehicle bays were added to the south and east sides of the building. The project was designed and supervised by Mandan architect, Al Fitterer. Currently used exclusively by the Mandan Fire Department and frequently referred to as the "Mandan Fire Hall," a third high bay was added in 2006 to house the eastside ground oil remediation system. Once the remediation is complete, the equipment will be removed and the area converted to a service bay for maintaining fire department equipment.